Here are some sample questions from surveys about the topic of young people’s health. Place number one to five before the question as it corresponds to and displays the abovementioned five dimensions of surveys. Questions with two or more answer options are useful for all types of feedback. Answers can be "yes/no" or a choice of multiple answers. Be careful not to leave out an answer option, or using answer options that are not mutually exclusive. Questions where there are no specified answer choices. These are particularly helpful for collecting feedback from your participants about their attitudes or opinions. However, these questions may require extra time or can be challenging to answer. In addition, the analysis of open-ended questions can be difficult to record/analyze, and may require extra time or resources to review. Example 1: What are two ways we could improve your experience with our company today? We take your feedback very seriously and review comments daily. Example 2: Do you plan to change to a new job or career in the future? If yes can you say why? Questions that require the ranking of answer choices by a specific characteristic are one type of scale questions. These questions can provide insight into how important something is to a participant. Example : Rank from 1 to 3 (1 is the highest priority) which of the following media is most influential among young people. Music _________ Films __________ Video games ____________. 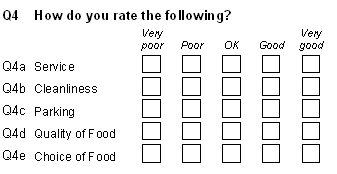 These questions use a rating scale for responses. This type of question is useful for determining the representation of an attitude, opinion, knowledge or behavior. See example below. Participants are asked whether they agree or disagree with a statement. Responses range from “strongly disagree” to “strongly agree,” with five total answer options. Each option is given a score or weight (1 = strong disagree to 5 = strongly agree), and these scores can be used in survey response analysis. For scaled questions, it is important to include a “neutral” category (“Neither Agree nor Disagree” below). 1. Which is the better open-ended question? What is the best weather to enjoy? What types of exercise do you find most enjoyable and why? Best choice b—invites opinion and reasons. Option a) is too speculative. 2. Which is the better multiple choice question? Best choice is a—as b is an individual preference that would be difficult to categorize. 3. Which ranking scale question has the best chance of providing good, useable data? Best choice is ‘a’ as b—ranking the ugliest spot when not all places can be actually rated as ugly. 4. Which rating scale question has the best chance of providing good, useable data? Best choice is a—because b is imbalanced toward positive side and only one choice on the poor side.